A lunch vendor in District 3 in Ho Chi Minh City, specialises in a dish that is described as crack fried chicken. Located on the corner of Truong Dinh and Vo Van Tan, mama Lang runs a tight ship with her daughter Thao. It’s a typical streetside affair. Everything is set up with a couple of large metal tables as their ad hoc cafeteria, complete with no fewer than ten different dishes on offer. At least six dishes are on rotation, depending on what is fresh at the market, but what doesn’t change is a couple of pork dishes, thit kho tau or braised pork in a caramel sauce, and suon ram, or pork ribs in a caramel sauce, as well as two very tasty chicken dishes. The ga ran or fried chicken is the business. While the chicken is moist and tender, it’s the glaze that puts it over the top. The crisp fried chicken skin holds a mixture of fish sauce with a heavy dose of garlic, chilli and brown sugar, addictive in its combination of sweet, spicy and umami. The other chicken dish, ragu ga, sees a wealth of chicken on the bone, potatoes, carrots and herbs swimming in the punchy tomato and annato infused broth. The stall gets really busy for lunch because of the proximity of several offices and one TOEFL center located just around the corner. A good place to go for sui cao is in District 5 on busy Tran Hung Dao. it’s a no-frills hole-in-the-wall that dishes out some seriously good dumplings. The English menu is also a plus, as most restaurants in District 5 are strictly Vietnamese or Chinese affairs. Sui cao refers to anything that is wrapped in rice flour dough. There can be a bit of confusion regarding sui cao and hoanh thanh as both are filled with meat and covered in dough. Hoanh thanh is wrapped in an egg flour dough akin to a pasta while sui cao is wrapped in a dough of rice flour. Sui cao is prepared in a number of ways: boiled, steamed, deep fried or potsticker style and is usually stuffed with minced pork and chives. While there is an abundance of noodle dishes, soups and grilled items on the streets of Ho Chi Minh City, salads seem underrepresented and are only found in restaurants. One vendor in District 1 bucks that trend and makes one of the best goi du du bo kho that can be found in town. The unassuming cart is manned by a trio of sisters and while the setting looks kind of generic the salad they serve is certainly not. Like most vendors in the city, they take the base of the dish and add their own flair to it. And by the looks of the crowd of motorbikes that are usually parked next to their cart, they are doing something right. This particular salad takes young unripe papaya julienned and this is the base upon which everything is built. Next is succulent bo kho or beef jerky. The meat has a glaze that is equally sweet, savoury and spicy, which paradoxically keeps the meat moist while it is being dried out. Aromatic herbs such as Thai basil and rau ram (Vietnamese coriander) are added along with rice croutons and roasted peanuts. Everything is dressed with a spicy chilli sauce and a slightly sweet, tart dressing made from fish sauce, lime and a bit of soy. The tart dressing melds with the smoky flavour of the bo kho while the peanuts bring a certain earthiness to the salad. The deep-fried croutons add some crunch to round out the dish. Those averse to spicy food should ask for “khong ot” or no chilli as this stall tends to douse the salad with the stuff. This restaurant is located on 84 Dinh Tien Hoang and they are famous for their crab, which they offer in a variety of styles. It is a favourite spot for those looking to feast on shellfish. Their most popular dishes include cha goi cua, a fried crab spring roll, and mien xao cua, glass noodles sauteed with crabmeat. They also serve just plain soft shell crab coated in your choice of sauce. This is the go-to spot for authentic street food. Tucked down a tight alley on the edge off Dinh Cong Trang in District 1, to the outside observer Banh Xeo 46a might not look like much, a mostly outdoor restaurant with red plastic stools and generic metal tables. The seating area is covered, and fan cooled, but it’s about as basic as you can get. The kitchen is also without walls, so you can see the chefs cooking on their large frying pans. The restaurant attracts large groups, often drinking and in high spirits, which when mixed with the constant stream of traffic flowing by your plastic stool can make for a uniquely Saigon atmosphere. Banh Xeo 46a is one of the better-known street food restaurants in all of Saigon, so it’s quite the popular spot, with a steady stream of customers at all hours. The specialty here is banh xeo, a fried, rice-flour crepe stuffed with savoury meat, generally pork and shrimp, a touch of diced onion, maybe some mung beans and a healthy dose of bean sprouts. A popular spot with the tourist crowd, portion sizes are quite generous compared to more local banh xeo carts. The Bund or Waitan is a famous waterfront area in central Shanghai. The area centres on a section of Zhongshan Road within the former Shanghai International Settlement, which runs along the western bank of the Huangpu River, in the eastern part of Huangpu District. The Bund usually refers to the buildings and wharves on this section of the road, as well as some adjacent areas. It is one of the most famous tourist destinations in Shanghai. Some of the most famous and attractive sight for tours around China at the west side of the Bund are the 26 various buildings of different architectural styles including Gothic, Baroque, Romanesque, Classicism and the Renaissance. The main attractions on The Bund for China tours are the Group of sculptures: Light of Huangpu River, Sail, and Wind; the Chenyi Square with a stone statue of Chenyi, who was the first mayor of Shanghai; and the Sightseeing Tunnel which is the first underwater tunnel for foot passengers in China. The Bund was once the financial center of the Far East. It is considered the city’s symbol since the 1920s. It is often referred to as “the museum of buildings”, as many different styles of European buildings can be found here including banks, hotels, exclusive clubs, press organizations and headquarters of international concerns. Now it is even more attractive as you can also see modern skyscrapers just opposite the Huangpu River. That gives you a strong contrast between modern life and the past. Nanjing Road is the main shopping street of Shanghai, China, and is one of the world’s busiest shopping streets. It is also the world’s longest shopping district; around 5.5km long, and attracts over 1 million visitors daily. Nanjing Road comprises two sections, Nanjing Road East and Nanjing Road West. East Nanjing Road is a dedicated commercial zone. In the east is the central section of the Bund and west of the Bund precinct was traditionally the hub of European-style restaurants and cafes, although in recent years these have become less of a feature as the demographics of visitors to Nanjing Road have shifted from affluent local residents to visitors from around the country. Close by is the Central Market, a century-old outdoor market today specialising in electronic components and digital media. Further west is the Nanjing Road pedestrian mall, the location of most of Shanghai’s oldest and largest department stores, as well as a variety of domestic retail outlets, and some traditional eateries with a long history that provides a unique China experience. Today East Nanjing Road becomes the first choice for many fashion-seeking shoppers. The Oriental Pearl Radio & TV Tower is a TV tower in Shanghai, China. Its location at the tip of Lujiazui in the Pudong district, by the side of Huangpu River, opposite of the Bund makes it a distinct landmark in Shanghai and a place for educational tours to China. The Tower was designed by the Shanghai Modern Architectural Design Co. Ltd. Construction began in 1990 and the tower was completed in 1994. At 468 m (1,535 feet) high, it is one of the tallest structures in China, the highest in Asia and the third highest in the world. It is classified as an AAAAA scenic area by the China National Tourism Administration in 2007. The Oriental Pearl Radio & TV Tower is a multifunctional venue with sight-seeing, restaurants, shopping, entertainment, Shanghai History Museum, Cruise Dock and a theatre for cultural performances. It has already become one of the most symbolic venues and tourism resources in Shanghai and it is acclaimed as one of the ten best views in Shanghai for tours around China. The tower includes 15 spheres of different sizes at different levels creating an artistic conception of “large and small pearls dropping onto a jade plate”. There is a revolving teahouse and a sightseeing platform in the TV tower, where the largest ball can accommodate 1600 people. Here visitors on guided tours to China can get a panoramic view of the Bund and Pudong New area. There are 6 elevators within the tower, five of which are installed in the three columns, including a double-decked one, and another one runs between the height of 250 meters and 341 meters. Two medium-sized elevators, accommodating 30 persons each and running at a speed of 7 meters per second, cover the distance from the bottom of the tower to the highest sphere in 40 seconds. The French Concession is the area of Shanghai once designated for the French, consisting of today’s Luwan and Xuhui Districts. Luwan’s Huaihai Road is a busy shopping street and is also home to both Xintiandi and Tian Zi Fang, extremely popular shopping and dining spots for tourists on travel tours to China. Xuhui is also popular for tourists and is home to Shanghai Stadium. After the Opium War of 1842, Shanghai had been opened up for foreign trade and it soon became home to several foreigners. The colonial French officers then created a district in 1849 for French people. The area expanded in 1900-1914, making it one of the most affluent and the best residential areas in the city. The early residents of the area were mostly French but the Chinese, Russia, American and British also lived in the area later. The area was ruled by French for around a century till 1943. The French Concession area is called as the Paris of East due to its several Tudor mansions, tree lined avenues, wrought iron fences and stair railings that’s very reminiscent of neighborhoods in France. Some of the highlights of the area for tour packages to China include Xinle Road and Changle Road, the best places for finding designer stores; The Former Residence of Soong Ching Ling, one of the main attractions which was built in the Xujiahui District where today the area has a small museum which is home to several artifacts related to Chinese politics leading up to the founding of PRC; Fuxing Park, a European style park which was earlier called the French Park and is very popular with the locals, with open spaces, gardens and dotted with clubs and restaurants, the park sees singing groups, tai chi artists, mahjong and card players and dancers in the mornings and visitors can walk along the Fuxing Road to see classical old Chinese-European buildings and enjoy the historical neatness of the road; The Cemetery of Longhua Martyrs, is more of a memorial garden and museum than a graveyard, but the acreage is beautiful and large. Yuyuan Garden is a famous classical garden located in Anren Jie, Shanghai. It was first established in Ming dynasty in 1577 by a mandarin named Pan yunduan who used to be the governor of Sichuan and later expanded greatly. The Yuyuan Garden was considered the best garden in southeast China. It enjoyed a history over 400 years since its first establishment by Pan yunduan who had intended to bring happiness and pleasure to his parents and relatives. Yuyuan Garden is a place of peace and comfort in the heart of bustling Shanghai. It became the headquarters of the dagger association or small-sword group uprising (an uprising in 1853 led by the dagger association, a secret organization, against the foreign imperialists in Shanghai and Xiamen of Fujian province). Now a great number of weapons, home-made coins and announcements used by the dagger association are on display in the spring hall of the garden. A large-scale restoration of the Yuyuan garden was conducted after the establishment of prc and it was opened to the public formally in 1961. It is one of the places visited in all inclusive tours to China. Upon entering the garden, you will encounter a rockery, which is called the Great Rockery. With a height of 14 meters (about 50 feet), it is the largest as well as the oldest rockery in the southern region of the Yangtze River. On the top of the rockery, visitors who travel to China can get a bird’s eye view of the garden. Cuixiu Hall sits at the foot of the rockery. It is a quiet and elegant place surrounded by old trees and beautiful flowers. The pavilions, halls, rockeries, ponds and cloisters all have unique characteristics. There are six main scenic areas here: Sansui Hall, Wanhua Chamber, Dianchun Hall, Huijing Hall, Yuhua Hall and the Inner Garden. sites Shanghai has to offer. Robot Restaurant is located in a basement in Shinjuku’s Kabukicho district. The restaurant sports bikini-clad women staging mock battles using enormous robots. It is more of a performance venue than an eatery; the show will assault your senses in a fun-filled hour of noise, light and kitsch and it is in the heart of the well-known Kabukicho entertainment district, a popular place for Japan tours. The front entrance is manned by a brontosaurus, a robot, and various costumed attendants and The waiting area and passage down to the theater are littered with glittering mirrors, lights, colours and images. The show itself is a cavalcade of action and frenzy–with robot fights, dancing girls, machines and gadgets, music, special effects and an intermission break that gives the audience a chance to pose with the cast. There are normally 3 shows per night (Tuesdays through Saturdays) at 7, 8:30, and 10pm. Jigokudani Monkey Park is part of the Joshinetsu Kogen National Park (locally known as Shigakogen), and is located in the valley of the Yokoyu-River. The name Jigokudani, meaning “Hell’s Valley”, is due to the steam and boiling water that bubbles out of small crevices in the frozen ground, surrounded by steep cliffs and formidably cold and hostile forests. The heavy snowfalls (snow covers the ground for 4 months a year), an elevation of 850 metres, and being only accessible via a narrow two kilometre footpath through the forest, keep Jigokudani uncrowded despite it being relatively well-known as part of travel packages to Japan. The park is famous for its large population of wild Japanese macaques (Macaca fuscata), more commonly referred to as Snow Monkeys, that go to the valley during the winter, foraging elsewhere in the national park during the warmer months. The monkeys descend from the steep cliffs and forest to sit in the warm waters of the hotsprings, and return to the security of the forests in the evenings. Since the establishment of Jigokudani Yaen-koen in 1964, it has been a worldwide popular place for Japan tours for watching the bathing monkeys and for ecological observation of researchers or photographers. The Momofuku Ando Instant Ramen Museum is a museum dedicated to instant noodles and Cup Noodles, as well as its creator and founder, Momofuku Ando. The museum has an instant ramen workshop allowing visitors on Japan tour packages to make their own “fresh” instant noodles (fresh as in just made). Reservations must be made in advance to enjoy this feature at the museum. There is also a noodle factory where visitors can assemble their own personal Cup Noodles from pre-made ingredients for a small fee of 300 yen. Just inside the doors of the museum is a glass case filled with medals and letters of recognition, not only from Japanese universities, but from culinary institutions as far away as Los Angeles and Brazil, all commending Ando for having invented the instant noodle. Inside you can see the kind of tools he worked with, the ingredients he used, and even a replica of the sink where he diligently washed his hands. Walking through the rest of the museum you will find hands-on exhibits of the kind often seen in science museums. There are cranks to turn, doors to slide, draws to be pulled out, automated demonstrations and quizzes. Then there are the modern additions of computer terminals and electronic games. In an interactive format, they tell the story of the challenges faced and overcome in making instant noodles what they are today. Yoro Park, The Site of Reversible Destiny was opened in October 1995 and is an “experience park” conceived on the theme of encountering the unexpected. By guiding visitors on tours to Japan through various unexpected experiences as they walk through its component areas, the site offers them opportunities to rethink their physical and spiritual orientation to the world. The site consists of a main pavilion, the Critical Resemblance House, the Elliptical Field and the Reversible Destiny Office. The Reversible Destiny Office was added in April 1997 and houses information about the site, drawings and other works, and screens a documentary about the site’s construction. The site presents itself to the visitor as a carefully considered construction of undulating planes, shifting colors, and disorienting spaces, thus providing a place of purposeful experimentation. Yoro Park has grown around Yoro Falls, placed among the top 100 waterfalls in Japan and claimed by Emperor Gensyou to not only give silky smooth skin after only one wash, but to cure all diseases as well. Tashirojima is a small island in Ishinomaki, Miyagi, Japan that lies in the Pacific Ocean off the Oshika Peninsula. It is an inhabited by about 100 people, down from around 1000 people in the 1950s and has become known as “Cat Island” due to the large stray cat population that thrives as a result of the local belief that feeding cats will bring wealth and good fortune. The cat population is now larger than the human population on the island. The island is divided into two villages: Oodomari and Nitoda. There is a small cat shrine, known as Neko-jinja, in the middle of the island, roughly situated between the two villages. In the past, the islanders raised silkworms for silk, and cats were kept in order to keep the mouse population down (because mice are a natural predator of silkworms). Fixed-net fishing was popular on the island after the Edo Period and fishermen from other areas would come and stay on the island overnight. The cats would go to the inns where the fishermen were staying and beg for scraps. Over time, the fishermen developed a fondness for the cats and would observe the cats closely, interpreting their actions as predictions of the weather and fish patterns. One day, when the fishermen were collecting rocks to use with the fixed-nets, a stray rock fell and killed one of the cats. The fishermen, feeling sorry for the loss of the cat, buried it and enshrined it at this location on the island. Many cat lovers come to the island on packaged tours to Japan. Shanghai Street art in China is a rare phenomenon and one that is causing waves in the Jing’an district of Shanghai. This small, traditional neighbourhood is slowly disappearing, with old buildings being demolished to make way for new developments. 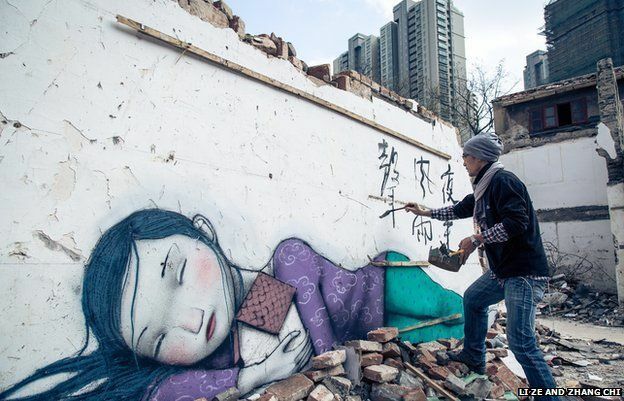 On the crumbling remains are poignant works of art, the work of french graffiti artist Julien Malland and Chinese artist Shi Zheng. The images are nostalgic reminders of old Shanghai and represent the unwillingness of residents to let go of the old neighbourhoods to make way for the relentless economic development sweeping most major cities in China. The images send a powerful message as they stand amongst the rubble and have been popular with locals and foreigners alike. But with this attention has come action from the authorities, who have authorised the removal of the graffiti. Jing’an is just one example of local residents coming together to offer a silent and unified demonstration against China’s relentless construction boom. They stand amongst the few remaining shikumen – the narrow townhouses that are an eclectic mix of Western and Chinese architecture – as they are demolished into non-existence. Travel Asia is a tour agency that specialises in customised, all-inclusive tours throughout China and Asia. We create adventurous, reliable and cost-effective customised tours for Australians wanting to travel throughout Asia.